Machine planting your flower bulbs offers enormous advantages, not only for the bulbs but for the surrounding residents - not to mention the residents of the beds and fields themselves, the insects. This rapid planting process minimises damage to the bulbs while limiting nuisance to surrounding residents and delays to traffic along the road. It is also minimally invasive for the soil where many insects make their homes. 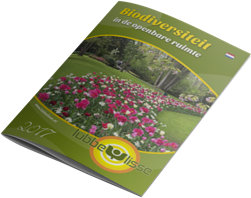 For over 20 years, Lubbe & Sons has used machinery to plant flower bulbs in many cities, parks and business complexes. Our services and options for machine planting flower bulb mixes have been specifically tailored to this purpose. Site visits, guidance in the design and selection of plants, and (most importantly) our aftersales service are all important aspects which come together to make this machine planting concept a unique total package. The embankment planter can be used for projects involving planting on a slope of up to 35 degrees. The side-mounted planter makes it possible to plant directly between and around trees or other obstacles, so that no space is left unplanted. Machine planting of bulbs can begin in mid-September. Depending on the weather, Lubbe & Sons may continue planting on behalf of its clients until late December. Since each and every client has their own specific wishes and requirements with regard to the different kinds of bulbs, density of plantings and results, it is impossible to apply standard pricing for our services. Following a thorough discussion of your needs and wants, we will (taking those wishes into account) present you with a bespoke proposal without obligation. Contact us for an individual quote. Our bulb mixes have an average minimum lifespan of six years when planted using a machine. The exact longevity will depend on aftercare and soil conditions. For proper flower development, it is important that the stems and leaves be allowed to wither naturally before the area is cut. Fertilizing occasionally using a high-potassium fertilizer helps to extend the lifespan of flower bulbs. See also our tips for planting various types of flower bulbs and bulb mixes. The knife cuts an opening in the turf. The by the knife created opening is created makes it possible for the the planting feet - which is adjustable in various depths - to easily slide under the sods. The baskets with the flower bulb mixture are emptied in the hopper of the planting machine. At the bottom of the hopper the bulbs fall on two conveyer belts. From there they are falling into the ground. The tires on the back of the planting machine ensure that the sods are closed again. In order to get the best efficiency from the result and the life span, it is important to add organic fertilizers to the planted flower bulbs. Our planting machine offers the possibility of fertilizing during planting by a small applicator which is mounted on the front of the planting machine. In addition to the fertilization during planting, extra fertilization can be given during spring. We also provide this service for you.